The Glass Lifter is designed for transporting glass sheets safely and securely with its fully automated jaws clamping on both sides, requiring minimal labor. The four lower wheels of the Lifter protect sheets of glass from abrasive particles and scratching by keeping them above the floor \\\' s surface. 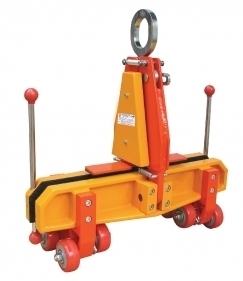 The four upper wheels of the Lifter are designed to create pressure on the surface of the glass sheet and act as a guide as the sheet glides into the clamp. An additional layer of vulcanized rubber on the clamp allows for added grip as well as extra protection for the glass being handled. The light and compact design makes it easy to transport and store.